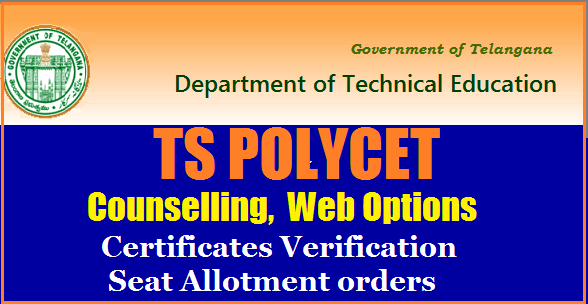 The Qualified Candidates of TSPOLYCET-2017 who have not attended for Certificate Verification earlier shall get their Certificates verified from designated Help Line Centres mentioned in the Annexure I. The candidates who have participated in Phase-I Counseling can also exercise options using their old password, Login ID, for the leftover seats now available and consequential vacancies that may arise in the process of allotment as per the schedule given below, and it is advised to exercise options for interested Polytechnics assuming that vacancies are available in the course of their choice. 2. Candidates Who Are Satisfied With Their Previous Allotment And Paid The Tuition Fee Through Challan Need Notexercise Option Once Again. 1. Students will be able to appear in the counselling according to their obtained rank. 2. Candidates have to go through the document verification and conselling payment procedures before appearing for the counselling. 3. Students are needed to bring the notified fee and documents for the verification process as per the specified date and time. 4. After verification, candidates will be able to fill their choices through online mode. 5.Seats will be allotted to candidates on the basis of filled choices and availability of seats. 6. Students can check their seat allotment through the website. 7. Candidates are required to appear at the allotted college with prescribed fees and certificates to complete admission process. TS POLYCET 2017 Hall Ticket. TS POLYCET 2017 Rank Card. SSC or Equivalent marks memo. Study/ Bonafide certificate from IV to X class and intermediate. Income certificate issued by MRO issued after 01.01.2017 ( in case the candidates desires to claim fee exemption. Candidates will get a receipt of certificates at Helpline centres after verification. 1. Allotments will be placed in the website https://tspolycet.nic.in on 15-07-2017 after8:00P.M.